Rishworthians player-coach Chris Stone had a twinkle in his eye after his side’s 29-18 win away to derby rivals rival Heath yesterday. “That should send a nice little shock wave through Yorkshire One,” said the front rower, after his promoted side had bounced back superbly from their opening day defeat at home to Old Brodleians. Heath had won handsomely at Middlesbrough in their first game and Stone believed his side’s success at North Dean would raise eyebrows among the other teams in the division. The sides scored two tries each yesterday but there was redemption for Rishworthians’ stand off Josh Kelly, who along with scrum half Ed Cockroft had missed vital goal kicks in a close match against the Brods. Kelly’s place kicking was not perfect against Heath but it was pretty good; he landed four penalties and two conversions before thumping over a 40 metre drop goal to seal a deserved success for his side. It was another derby match involving Heath which was marred by a serious-looking injury. The second half was only seconds old, with Rishworthians 10-0 up, when home flanker Ben Maxwell went down with a knee injury and an ambulance was summoned. The match was completed on the adjoining pitch. Rishworthians had been forced into a handful of changes and they were under the cosh for the first 10 minutes as Heath, with Kiwi centre Jordan Bradbrook to the fore, probed for an opening. None was forthcoming, Kelly cleared and the stand off opened the scoring with an angled 35 metre penalty on 13 minutes after winger Kian Stewart had made ground down the right. Heath were threatening to get on top in the scrums but their visitors, with three props in their front row, dug in and later prospered. The heavens opened and a succession of knock-ons led to Kelly and Ezra Hinchliffe trading kicks as the safest way to make ground. Hinchliffe’s failure to field a kick led to the opening try on 29 minutes, visiting lock Fraser Swarbrooke going over 10 metres to the left of the posts. Kelly, who had a couple of penalty misses in the first half, added the extras. The visitors were growing in confidence and a powerful surge from burly prop Harry Whitfield might have produced a try in the corner for scrum half George Wright, an impressive deputy for Cockroft. The teenage debutant was ankle-tapped trying to round the final defender. It took the sides 10 minutes to get their bearings on the smaller second team pitch but then, in bright sunshine, the points started to flow. A 40 metre penalty from Hinchliffe got Heath on the scoreboard, only for Rishworthians to move 17-3 ahead on 55 minutes when centre Ben Waud strode through the middle and Stewart provided the support. 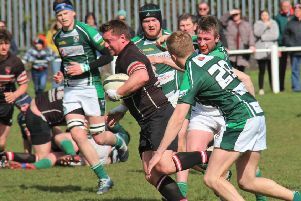 The sin-binning of visiting lock Richard Bullough gave Heath an opening and forward power earned their skipper Ian Downsborough a try converted by Hinchliffe. Hinchliffe missed the conversion and Rishworthians held their nerve, a long-range Kelly penalty and the drop goal denying Heath a losing bonus point. That left Stone elated and his Heath counterpart Dave Harrison perplexed by his side’s continuing inconsistency.